Emma Wall: Hello and welcome to the Morningstar Series 'Ask the Expert.' I'm Emma Wall. I'm joined today by Germaine Share, Morningstar Fund Analyst to discuss the exit of the manager of the Templeton Emerging Markets Trust (TEM). Wall: So, we've just had some news about the Templeton Emerging Markets Investment Trust. Carlos who took over from Mark Mobius in October 2015 is stepping down as lead portfolio manager. Share: That's correct. So, effective today actually, Chetan Sehgal who is the co-manager on the fund – since Carlos has been appointed in late 2015 – he'll be stepping up as a sole manager here. Wall: So, there is some continuity. It's not like some fund manager exits, where we hear and there is no one to take on over, there is some continuity here for investors. Share: That's exactly right. So, we actually cover the open-end vehicle as well and we followed Chetan for a number of years. So, he also covers the small cap strategies for the group, which are rated Bronze. So, he is a very capable manager and we're very confident that he'll be able to fare well as on his own here as well. Wall: And under Carlos, the Trust had a Neutral Rating, didn't it? Share: That's correct. But we have noted a lot of improvements since he has taken over. He successfully turned around performance, and the risk management on the fund has improved a lot. You've seen a more diversified portfolio and there's more structure around how they allocate sector and country exposure as well. Wall: So now that he is leaving, what does this mean from an analysis point of view? Share: That's a great question. So, we would advise investors not to panic. We feel like Chetan will do a great job on his own. Like I mentioned before, he is a very capable investor. He has a really good track record in his small cap strategies, which also invest in emerging markets. And so far, we have seen him do a terrific job on the large cap focused emerging markets strategy as well. Wall: So, does this mean that this fund is under review until you and the other Morningstar analysts can go and speak with the team there? Share: Given our familiarity with Chetan and the job that he is doing so far, we're comfortable keeping the fund at our Neutral Rating. Wall: Germaine, thank you very much. 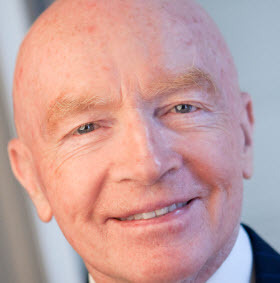 What Does Mark Mobius Retirement Mean for Investors?